The Enchanted Valley is a hidden Shangri-la lying in the deep, wilderness heart of Olympic National Park. Nestled in the verdant meadows of this valley is a nearly 100 year old Chalet that has been a shelter for rain-pelted hikers, and a base for mountain rescue missions. But this historic shelter is threatened by the flooding of the Quinault River and is on the verge of being lost forever. But how did the Chalet, after standing untouched for a century, come to be at risk? 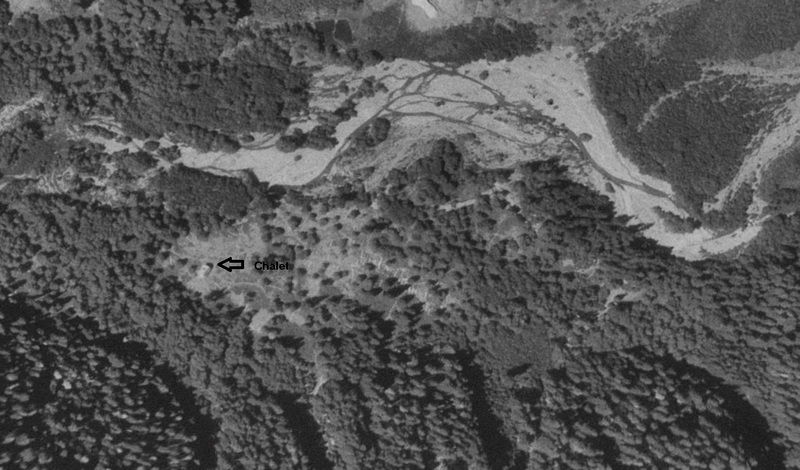 When the Chalet was built in 1930, the river followed a well-defined course 500 feet away, and had (as recent studies have shown) followed that course for hundreds of years. Why is the river now carving a wide gravel flood plain out of long established meadows? The fault, at least in part, lies at the feet of humans. 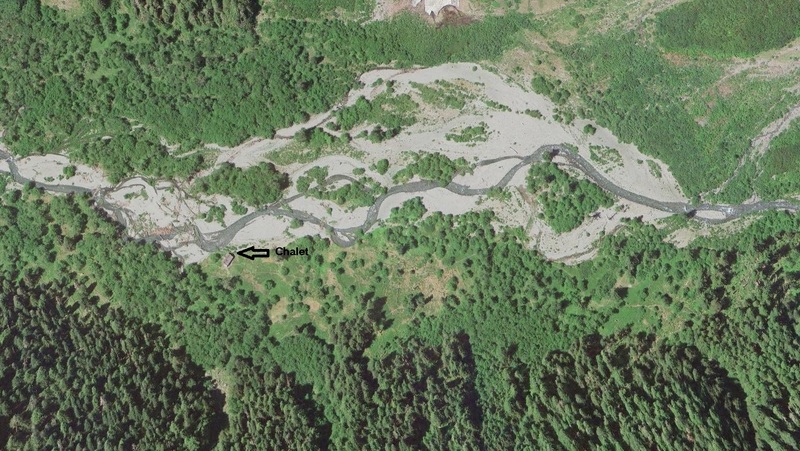 In the early part of the 20 century, the Anderson glacier, which is the source of the Quinault River, was much larger and retained more snow through the spring and summer. 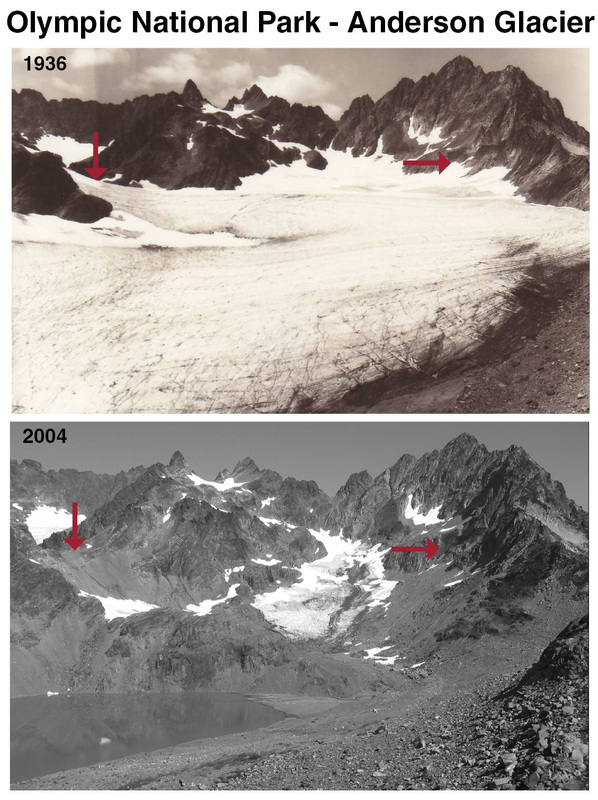 However, due to Global Warming, a process accelerated by the burning of fossil fuels, the glacier has receded dramatically and no longer retains as much snow through the spring melt. This has resulted in violent spring flooding such as was unseen back when the Chalet was built. A further factor in the erosion of the meadows is tied to the extinction of wolves in the Olympic range. When wolves were systematically exterminated in the early 1900s, the population of herbivores such as elk and deer, whose numbers had been kept in check by large predators, exploded. Overgrazing by large numbers of herbivores has severely inhibited the growth of stream side vegetation. Without this vegetation, the river more easily carries away soil previously held in place by roots. 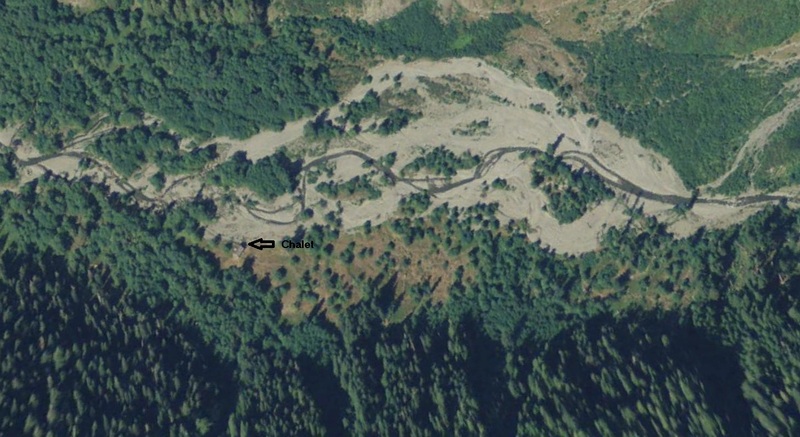 Thus, the river has eroded its banks and formed the braided channels that threaten the chalet and destroy the meadows. Another example of how humans have impacted the valley and its meadows indirectly was the eradication of beavers in the Olympic Mountains by trappers in the early 20th century. Beavers build dams that create catch basins for water during times of high flow. Many tiers of Beaver dams can also slow the flow of water, thereby lessening erosion. Further effects of Beaver dams include increased riparian plant growth, and the filtering of sediment through the dams. This decreases the buildup of channel altering debris along undammed portions of the river. 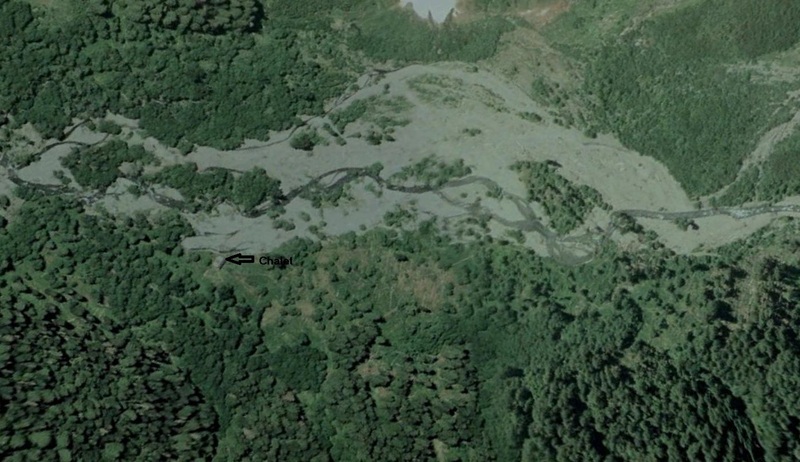 Without the beavers and their dams, floods are more violent, erosion is worsened by faster flowing water, and sediment buildup in the floodplain causes the channel to be diverted frequently. So what can be done to save the Chalet? The obvious solution is to move it. 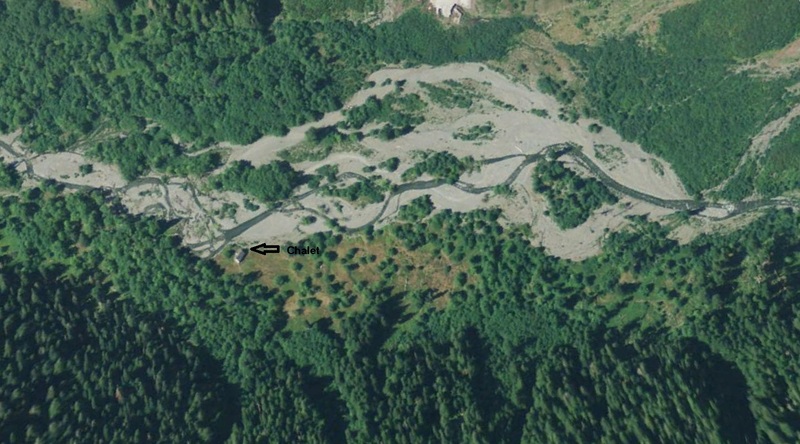 Plans were made for this eventuality in 2007 when the river began to move towards the Chalet. However, the park service was able to divert the river back into its original course by moving fallen trees in the river to strategically channel the current. This lasted for several years, but recently the river has again moved toward the Chalet and is now only a scant few feet from the building. The park service is monitoring the situation via weekly fly overs and is assessing their options which are inhibited by the unpredictable nature of the river and the strict regulations of the Wilderness Act. It would appear that humans are indirectly the source of many ecological problems in the Olympic Mountains, and it should be our duty to try to repair the damage we have done. In a way, the Enchanted Valley chalet has become part of the ecosystem, and is an indicator of the health of that system. If we cannot stop the melting of the glacier or return the predators to the food web, then we must find other solutions to save this historic structure and the meadows that should be surrounding it, or it will all be lost forever. How far up the valley is the chalet? Can anyone who wants to stay there? Does it have any caretakers who protect it from misuse? An interesting article. It's 13 miles by trail, and it's currently only used as an emergency shelter and a backcountry ranger station. As for caretakers they mainly include the Park Service although many individuals have contributed to its upkeep and restoration. I take it moving the chalet is not feasible. Great post, thanks. Moving the Chalet is quite possible, and the park service is considering several options of how to do it, including dismantling it altogether and rebuilding it in another location, flying in rails and sliding the Chalet along them, or they could simply air-lift the chalet in three pieces (roof, second floor, and first floor) to its new location. Fall hiking in the Columbia Gorge.